We’re pleased and proud to present this guest post from Meredith Low, Principal of Meredith Low Consulting in Toronto. Meredith is in Ottawa this week, attending and speaking at the Engaging Associations Summit hosted by our (mutual) strategic partner, Greenfield Services Inc.
With the breakthrough of digital marketing has come the ability to manage and manipulate data at unprecedented and ever-increasing levels of complexity. And along with that ability has come the expectation that we can get the job done with the wave of a magic wand, producing reports and insights effortlessly and in real time. Most of us know we’re not quite there yet. But the increased expectations are fair in many ways, and it’s the savvy marketer who puts in the time to master the new analytical environment. It’s not about the platforms and software, the bells and whistles. Those come and go. Fundamentally, it’s about your approach. 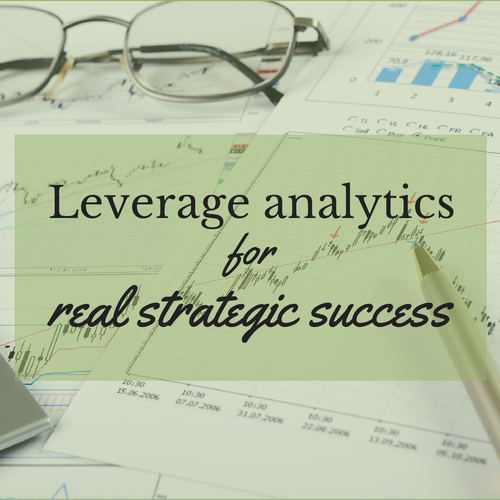 Here’s how you can leverage analytics for real strategic success. #Marketers must master the new #analytics environment. Far too many people try to answer a question by starting with the data and working their way to some kind of report or dashboard. It should be the other way around. Whether you have someone else run the reports you dream up, or do the data-crunching yourself, you need to take a step back to the question you’re trying to answer. If you had access to perfect data, what would you want to know and why? And then, in the real world, what data do you have access to that can act as a proxy for the perfect data that doesn’t (yet) exist? What’s your organization’s strategy? What’s your marketing strategy? What are your tactics? Your goal in analytics is to evaluate the progress you’re making toward meeting your basic objectives. In developing your strategic plans, you (or other people) made some hypotheses about how the world works and how you can influence it (by marketing to a segmented audience, by blogging, by writing headlines a certain way—whatever your strategy or tactics happen to be). Analytics should tell you whether your hypotheses are proven, disproven, or need more testing. The hypotheses drive the questions you ask. Focus your #analytics to test your #marketing hypotheses. But because life is full of contradictions, there are also times when it’s worthwhile to just wander around the data. Gather together everything you can, from whatever tools you use—Google Analytics, Hubspot, Hootsuite/Buffer/Tweetdeck/Sprout Social. See what’s there and what it can possibly tell you. Keep an eye on their analytics and reporting capabilities, including tools that connect your marketing activities to observable customer or audience behaviour. Data availability changes, data quality changes, and what we’re interested in changes. Each of us needs to be master of our own domain of analytics, and that includes really understanding—interrogating, testing, querying—the data sources available to us. Sometimes apparent contradictions in the data lead us onward. Maybe we can fix a problem before it gets too big, or flag an interesting opportunity to evaluate based on something we spot in the data. Contradictory #data may be an important clue. Any analytics report must tell a story. Connect the reporting back to your strategy, and to the questions you set out to answer by gathering your data. What are the trends? What’s emerging from the data that’s interesting? Where are the surprises? And then, so what? Why should we care? What, if anything, should we change, having performed this analysis? Your #analytics report must tell the story behind the #data. If you’re a content or digital marketing specialist within your organization, remember that not everyone who sees your budget necessarily understands what you do, or why. So you should take advantage of opportunities to make the case for the work you do. However, it’s career-limiting to be too defensive or self-serving in the way you use the data. Instead, take a bigger picture approach. If you know your organization’s strategy, you can make it the context for your tactics—then let the analytics tell the story of the value you add. At their best, analytics are a way to shed light on the progress you’ve made and the road ahead. Sometimes they produce a flashlight, sometimes a floodlight. But either way, the data should give you a clearer view of things that were previously hard to see or understand. Knowing how to shine that light, on the right questions at the right time, is indispensable in marketing, for you and your organization.